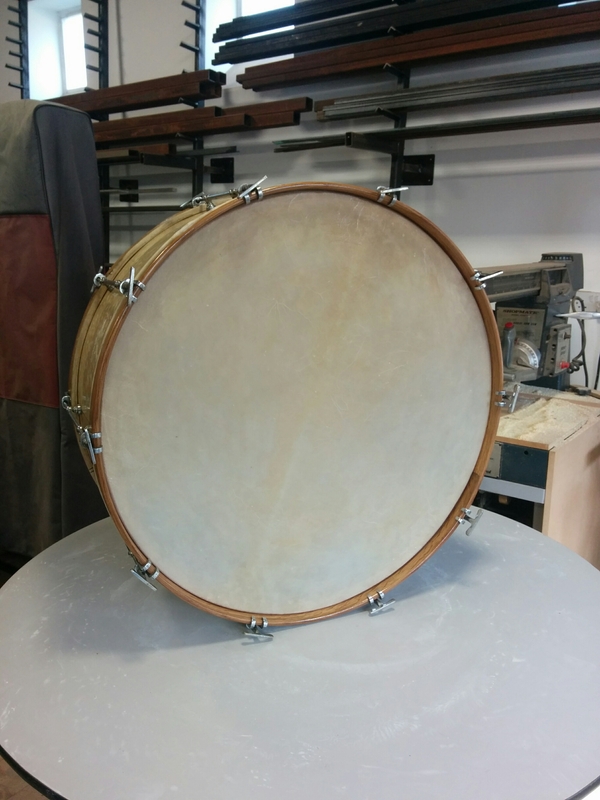 In the first half of the repair of this vintage bass drum (1233: (pt 1)), I wrote about making a new counter hoop, fixing the shell and making replacement tuning lugs. The lugs are now back from the chrome platers, but more importantly, the drum is now needed by my customer at the end of the month. In order for me to realise the deadline, and fit in with my delivery schedule, I need to finish the bass drum today so it is ready to be delivered at the end of the week. After selecting a calfskin big enough and then putting it in to soak, I get everything ready to lap the head onto the existing flesh hood that I repaired. I like to leave the lapping to dry for a bit, so that the skin becomes tacky and starts to stick to itself before I put it on the drum. It will take 48hrs for the skin to completely dry around the hoop, but the playing surface will start drying quickly. So as long as I keep the playing surface wet, I have plenty of time to do the drum and get the head on later in the day. In 1233: (part 1) I made new barrels for the tension rods to screw into. What I didn’t have was a tap long enough to put in a 2.1/4″ deep thread into the barrel. I had to order these specially, so sent the stuff to be plated during the delay. The video below shows the problem I had. It is a bit boring (in both meanings of the word), but it shows how the thread feels like it is going on and on and on. Once the threads are cut and checked, I can assemble the drum shell and start preparing to put on the head. I have mentioned putting on heads in other posts, and explained what I do. This time I remembered to video it! With both heads evenly set, the drum is now finished, and has plenty of time to dry before Friday. Today of course is polling day – time for us to support the essentially anti-democratic and self serving political system that we have here in the UK (and aggressively export). We will all (well about 10% of us) go out and give a mandate for 650 corrupt, dishonest and dishonorable bloody idiots to avoid the big issues for another 5 years. Politicians call it voter apathy (because they are a bit thick) but I think that they are wrong; it is not apathy, the general public is more political than ever (the one good thing that ukip have exposed). In our democratic system we have no constitutional ability to change how the country is run. The ability to do that is in the hands of the government, and mp’s won’t vote to get rid of themselves, they won’t even take a pay cut! Rant over. I’m looking around for a smaller (26×14 ish) secondhand drum, but a colleague has suggested buying a brand new smaller drum (e.g. 22×12 or 24×14) from a manufacturer such as Gewa or (dare I say) Percussion Plus, and just fit the best possible heads (calf, and/or thickest Fiberskyn available). Is this worth it, or should I keep searching for a good secondhand one instead? This is a difficult question to answer because so much of the “quality” of musical instruments is either subjective and/or affected by external factors such as room acoustics and psychology. What I don’t know is whether modern drums would have a reinforcing hoop at the bearing edge, I would doubt it; the modern method is to use a generally thicker shell. For me, this is the wrong direction; a thinner shell will move more and give greater projection and depth to the timbre and consequently a deeper sound (pitch). This reinforcing hoop is also important if you think that you will fit calf heads; calfskin is extremely powerful and you will need the shell to be strong enough to cope. 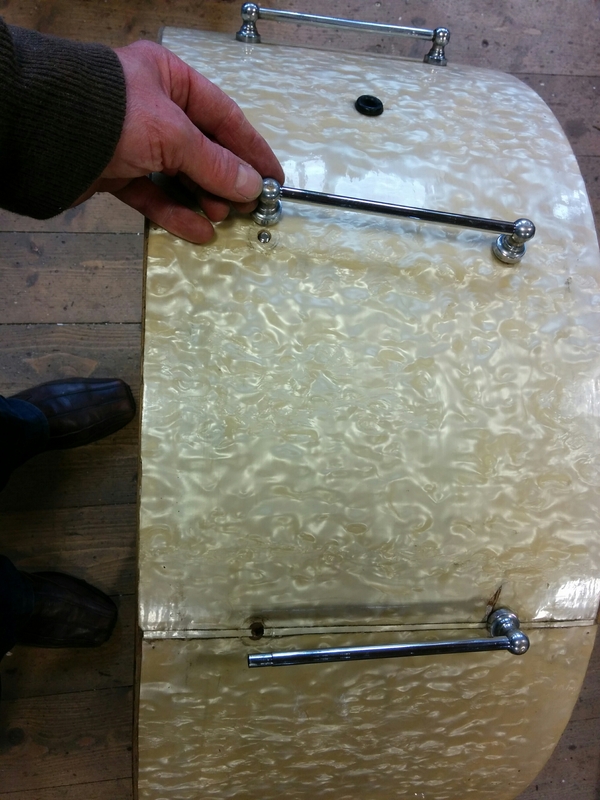 In addition to the shell resisting the pull of calfskin, the ironmongery must also be up to the job, so a modern drum will need to have more fittings to spread the load, whereas older drums will have thicker rods made of better steel and with a courser thread. I hope this helps – it all points to older drums.